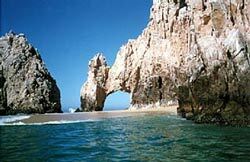 The colossal rock formations that mark the tip of Mexico's Baja Peninsula, where the warm waters of the Gulf of California and the cold Pacific meet to produce one of the world's fabled sportfishing grounds. The Spanish conqueror Cortés named The Friars when he first spied them back in the 16th century, and from a distance they do resemble a procession of hooded monks. Up close, they loom hundreds of feet above us. Crabs scuttle along their flanks; frigate birds and pelicans perch on their ledges. 1 Can't-be-beat fishing The waters around Cabo are rich with blue and striped marlin, wahoo, tuna, sailfish, dorado, and blue sharks. 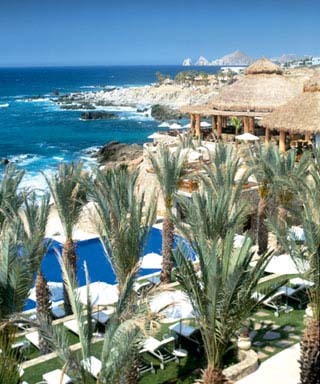 2 Hotels to suite every style The newest and most luxurious is Las Ventanas al Paraiso (from $525 per night). 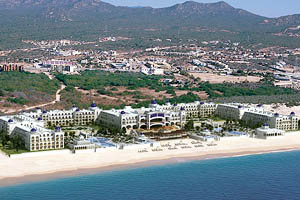 featuring suites with terraces and ocean views, a spa, and a serpetine pool. We prefer staying at the 24-year-old Hotel Twin Dolphin (from $285 per night), which is like living in a small seaside village. 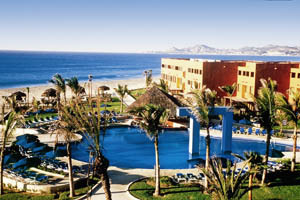 Its villa rooms and suites overlook surf-lashed rocks and a wide beach. No phones, TVs, clocks, or fax machines in the rooms, but you will find a great tennis pro, Californian Ron Ristroph. The Palmilla (from $395 per night), built in 1956, is set back amid towering palms, and rooms are decorated with Mexican textiles and folk art. 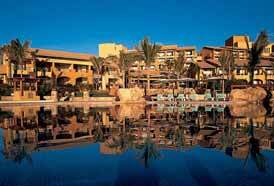 The low-key Hotel Cabo San Lucas (from $115 per night) is home to one of the area's best restaurants. 3 Great golf, tennis, and water sports The desert terrain here covers a reservoir of underground water, making for fantastic greens. There are also hundreds of tennis courts. Gray and humpback whales migrate to the Cabo area between January and March and are easy to spot, and the views beneath the surface are also superb. 4 Todos Santos About an hour's drive north of Cabo, this town makes for a wonderful day trip. Set on a hill above the Pacific, Todos has developed into a small artists' colony, with painters and sculptors (and organic farmers) in abundance. Just outside town, mango, avocado, guava, papaya, cirtrus, and coconut orchards strech for miles around. Todos is also home to Café Santa Fe (Calle Centenario; 114-5-0340), easily the best restaurant around. The mostly Italian menu centers on local ingredients and the fresh herbs and produce grown out back. For lunch, try Caffe Todos Santos; for jewelry and hand-carved furniture, stop in at Manos Mexicanas (both on Calle Centenario). 6 Fresh seafood The best restaurants serve fish straight from the ocean. At the frenetie Nick-San (Plaza de la Danza; 114-3-4484), a block from the Marina, sushi is fantastic and the tempura as light as can be. Neaby, the romantic seaside Sancho Panza Wine Bistro (Plaza Las Glorias; 114-3-3212) has an extensive wine list, a "new world tapas" menu, and live jazz and blues. 7 The roadside food stands Along the highway by the airport, make a point of stopping for a huarache, a sandwich of grilled pork, beef, goat, or chicken piled with cilantro, lettuce, tomatoes, lime, and salsa into pitalike grilled flatbread. 8 Tequila The collection at the exuberant Pancho's (Calle Hidalgo; 114-3-0973), at 490 labels, is said to be the world's largest. Try one with some of the traditional Oaxacan, Pueblan, and Yucatecan food, or with mesquite-grilled seafood, chicken, or ribs. At Pancho's, in San Jose del Cabo, you can order by the glass from a selection that ranges from $6 to more than $55. Drink it with one of their excellent steaks. 9 Shopping Look for handmade crafts, folk art, antiques, and furniture at Mama Eli's (Calle Cabo San Lucas), Casa Maya (San Jose del Cabo), and El Callejo (Vicente Guerrero), and for Mexican Blankets at Cuca's Blanket Factory (El Bordo near The Glass Factory). 10 Driving The spectacular 1,000-mile trip from Tijuana to the southern tip of Baja is like a step back into the old unspoiled West -- with desert, mountain, and intermittent sea views on either side.